Yesterday we had the first session of a Rouge Trader Role Play that i am running for a group of friends and having deiced to publish these sessions in a report style of post i did just that and wrote up the session and posted it. This morning i was reminded providing basic setting information would be a good idea, where were the session taking place, what was Port Wander? Where was the Kronus Exspane? Well thankfully the Rouge Trader Core Rule book has all those answers, and so i present to you the background setting that the Role Play is set in, enjoy. The Koronus Expanse is the name given by Imperial authorities to a dangerous unexplored region of the Halo Stars beyond the Calixis Sector. The Expanse is accessed through the Koronus Passage, a treacherous but navigable route through the great warp storms that bar passage to the Halo Stars beyond the way station of Port Wander. As is true of the Calixis Sector itself, the Expanse was untouched by the God-Emperor’s Crusade many millennia ago—and so it is a realm of fearsome xenos, treasures beyond imagining, heathen worlds of men, and the echoes of ancient doom. The Koronus Expanse in the the 41st Millennium is a scattered, partly explored region containing a few young colonies and vast natural wealth still barely exploited. Rogue Traders vie with one another for known resources, heedless of lives lost in the pursuit of riches, while a tentative attempt at Imperial colonisation follows in their wake. Drawn by the flow of wealth, pirates and servants of the Dark Gods have also slipped into the Expanse, eager to cast destruction upon the works of the God-Emperor’s faithful, living by what they wrest from dead hands, while the Expanse itself holds many secrets and native inhabitants no less dangerous. For centuries, Rogue Traders have braved great evils and the treacherous warp to venture into the Koronus Expanse, but their efforts have barely begun to uncover its secrets. Footholds have been built close to the few semi-stable warp routes into the area. Here, resource-rich worlds are exploited, xenos ruins excavated, trade envoys meet with heathen lords, and colonies are attempted upon sheltered worlds. This effort has been enough to shower wealth and fame upon the fortunate—and make corpses of the rest. The gateway to the Expanse is littered with broken vessels and tales of the vanished. Beyond these human conflicts lie truly dark and dangerous voids, rife with rumoured terrors, undiscovered stars, and worlds of men who have never known the God-Emperor. There are no defined warp-routes, no safe ways through the swirling empyrean. 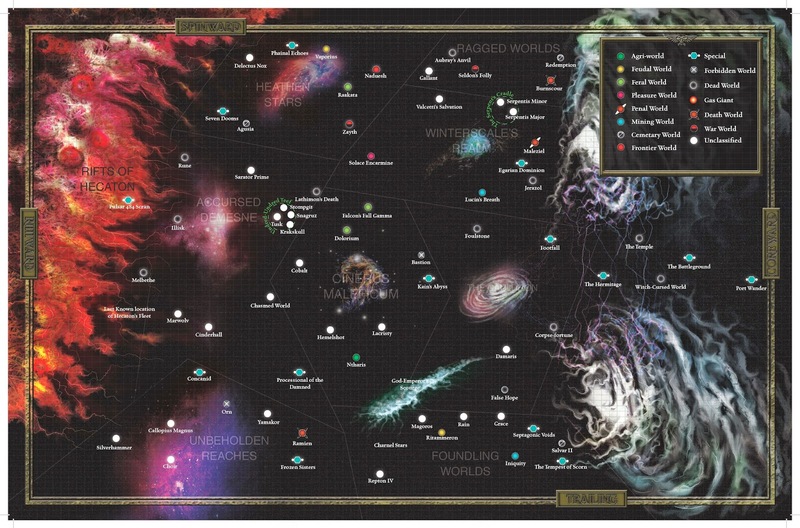 These regions hold the fearsome Ork, the treacherous Eldar, and strange ruins that lie beneath the light of dying stars. The warp space of the Koronus Expanse is treacherous and unknown in the main, and the partially explored regions of the Expanse are islands of Imperial activity amidst a vastness of danger and mystery. Navigating is a far cry from traversing the established warp routes of the Calixis Sector. Most of the Koronus Expanse is known to the Imperium only though legend, revelation, and hearsay. The Rogue Trader who ventures into this unknown risks his very soul upon the talent of his Navigator, and on the quality of what little information he has gleaned from those gone before. Beyond the partly explored regions of the Koronus Expanse, past deeps beset by pirates and dread xenos, lie many worlds and strange phenomena which exist as the stuff of dark legend. Some of these uncharted stars were visited by a single Rogue Trader whose tales are doubted or dismissed by rivals as outright lies, while others are known only from dubious and apocryphal sources such as Thulean datavaults recovered from Dolorium’s voids in 741.M41, or the infamous prophetic visions of the Seven Witches of Footfall. Beyond the larger nebulae of the Koronus Expanse are regions visited only by the silent Disciples of Thule and a few others. Tales are told of ghost-vessels, beauteous but deserted worlds, dust-nebulae that claim the souls of the damned and forsaken—and of course, wealth beyond measure awaiting the courageous Rogue Traders who will claim it. are ill-omened places of which little is known apart from the uncertainties of myths and prophecy. Before i go there is one other thing i would like to talk about. Whilst browsing Trade i noticed that a account going by the name of Livewire Games is offering a 15% discount on all GW related stock. If you want a good price on GW products then check out their Trade Me account or their Website. Until next time. Thank you for documenting your games in this narrative style. I've really enjoyed it so far. Jayden's character sounds like they'll provide some interesting highlights along the way. Great roleplay so far dude. Whats so Bad About Herohammer?